We’d love your help. Let us know what’s wrong with this preview of Abduction! by Peg Kehret. To ask other readers questions about Abduction!, please sign up. I was hooked the minute I started this book. I wanted to reach through the pages and shake all of these characters because they weren't doing what I wanted them to do lol. I had to finish it because I had to know what happened. This is definitely a good, quick read for anyone who likes mystery-type books. Abduction is a book written by Peg Kehret. It's about a six year old boy who was abducted by his father who was never in his life. The boy's name was Matt. Matt was on his way to the bathroom five minutes before school was over. His father, who Matt has never met, was near the bathroom dressed as a worker for UPS. His father's name was Denny Thurman. Denny Thurman had stolen Matt and his family's dog and used the dog to trick Matt into his car. After denny got the job done, he left the dog, Poo Abduction is a book written by Peg Kehret. It's about a six year old boy who was abducted by his father who was never in his life. The boy's name was Matt. Matt was on his way to the bathroom five minutes before school was over. His father, who Matt has never met, was near the bathroom dressed as a worker for UPS. His father's name was Denny Thurman. Denny Thurman had stolen Matt and his family's dog and used the dog to trick Matt into his car. After denny got the job done, he left the dog, Pookie, tied to a pole at a local park. Matt was usually waiting for his older sister, Bonnie, by their bus, but that day he wasnt there, After a couple of minutes, the school called the police. After about two weeks of Matt's family an police searching, Bonnie remembered she and her friends had tickets to a Mariners' game. While Bonnie was waiting for her friend to finish getting snacks. Bonnie thought that she saw Matt. She also thought that she was going crazy. She went closer and the seat was emtpy. After she was on her way back to her seat, Matt and his father were leaving the game. Matt had truned around and saw Bonnie. She ran to him. Denny forced her to go with them with a gun. After a while, the two got home safely, and so did Pookie. this was a very good and interesting book it gives you a moral of not to do some things with strangers. Kids ages 10+ should read this because it occurs some facts younger kids might not want to know. the moral of this story is very true and all kids need to try to follow this moral. This is the only book that I ever stayed up all night to finish. It was so suspenseful I had to know what happened next. Loved it! This book is about a 6 year old boy, named Matt who was in kindergarten. Who was abducted by his father from school one afternoon. Matt’s father wasn't in his life and had planned out a way to take him from school, with the hopes of not getting caught by anyone that knew the boy. Matt had left class early because he needed to use the restroom and that’s when his father made his move. His father's name was Denny. Denny had dressed like a UPS worker and in order to get a visitor pass said he was making a delivery to the library, only that's when he ran into Matt on his way to the restroom. Denny has kidnapped the family dog pookie and used him to get Matt to go calmly to his car by saying that the dog was hurt at that they needed to get him to the vet quickly. Denny’s plan was so far working. He got matt to the car and off they went without anyone so far noticing. It wasn't until Matt’s sister got to the bus where they met everyday and he wasn't there in line waiting for her. She got really concerned and that's when the search started and the cops were called to file a report and to let the news out to the public with a description so that they could help with the search. Matt was very brave during his ordeal and did everything his father would ask him to do and believed every word he said, even that his mom and sister were killed in a car accident. Denny took Matt to a baseball game because he knew how much Matt loved the sport, little did he know that was gonna be his weak moment and he would be caught by Bonnie, Matt’s sister had went to the same game with a friend. Bonnie had thought she might of seen matt, but when she got over to where she thought he might be sitting he was gone, the seat was empty, as she looked around Matt had spotted her and they ran to each other. Denny Matt’s father held a gun to Bonnie and forced her to go with them. Now the two of them were being held by Denny and they had to figure out how to get away. Denny tried pushing Bonnie off the side of the boat and that's when Matt hit him in the head with a baseball, that's how the two of them made their escape, and made it back home safety and so did pookie, who originally Denny left in a park. The suspense in this book left me not wanting to put it down, i felt like the characters were relatable, that Matt even though he was scared tried to stay brave and do what he was told. Bonnie knew her brother was out there somewhere and she was gonna do everything she could do to find him, she was not gonna give up until he was found, I'm glad that the scenario turned out the way it did that the kids weren't hurt and Denny was caught and sent to jail. I think all kids should be taught not to talk to strangers, should not under any circumstances leave or go with someone that they don't know, missing children are reported everyday, and most of the time have been taken by the parent that they don't live with, under these circumstances it would be harder for the child even when they know right from wrong to not go with the other parent. In this situation Matt was taught right and did the right things by listening to his dad and doing what was asked of him. Bonnie was also brave and strong, her will to never give up was powerful. The story gives real scenarios to what could happen and i would recommend anyone looking for a suspense, thriller, or a real life true story scenario to definitely read this book. It definitely makes you think. This author has a few other stories i believe are along this same story line of what could be true life actual events, i plan to read the other three with the hope that i will learn a life lesson and not want to put the book down. Matt always wondered about his dad. And one day, his dad took him from his school and told him he would never see his mom or sister again because they died in a car accident. Matt regretted what he wished for, but he was sure this was his new life... until he saw his sister at a Mariner's game. This book was a page turner, but it was out of pure curiosity, not out of an intriguing story line or excellent writing. Pros: the story line was intriguing, mysterious, and suspenseful; the charcter identities were well illustrated and easily identified, including secondary characters. The process of an abduction - from the policy investigation, to an amber alert, to the fading news stories seemed well researched, or if nothing else, well observed. Cons: the writing was very basic, and so it felt too innocent, almost. Even for a small boy, I expected there to be a little bit more fear and anger illustrated, but it felt like the author was trying to make it easy for a small boy to read. Which brings me to the identification of this book - it's marked as a children's book, which really just bothers me. I always reference the page of the book that shows the copyright and publishing information, which gives me an idea of when the book was written, a summary, and the identification of the book - usually in 3-5 categories. This was identified as a children's book, which was a little strange to me. It just kind of lingered over me throughout the book. This review has been hidden because it contains spoilers. To view it, click here. Abduction by Peg Kehret is a great book that I enjoyed reading. I first began reading this in fifth grade, I read about 25 pages and was forced to return the book to the school library because it was the end of the year. Five years later I decided the return to the book. When I returned to reading it was even better than the first time because I had a better comprehension of the book and what was going on. This book is in my top 10 ever read. "Denny hung up, disappointed. He would have to wait a Abduction by Peg Kehret is a great book that I enjoyed reading. I first began reading this in fifth grade, I read about 25 pages and was forced to return the book to the school library because it was the end of the year. Five years later I decided the return to the book. When I returned to reading it was even better than the first time because I had a better comprehension of the book and what was going on. This book is in my top 10 ever read. Denny Thurman has a son named Matt. Before Matt was even born Denny left his mom Ms. Sholter. Denny had an issue with gambling and often moved from city to city because he didn't pay his gambling debts. In a culture where taking care of your children and having a family is correct Denny is far from it. Eventually the culture around Denny got to him and made him want to change. He has never seen his nephews and their parents bash him because of his lifestyle. His makes plans to meet with them and bring his son along with him. Denny knows that matts mom won't let that happen so Denny decides to kidnap his son. This is a example on how the culture of the outside world can influence others. This book was about a little boy named Matt his sister Bonnie and his dad that Matt has never met named Denny. One day Matt is at school and got lured into his dads car. The dad took him home to Denny's house and Matt was really scared. There was a lot of people searching for him but his sister was working the hardest. Her mom told her to take a break and go to the Mariners game. When she went she found her brother but the dad threatened her with a gun so she had to go with them. After the game This book was about a little boy named Matt his sister Bonnie and his dad that Matt has never met named Denny. One day Matt is at school and got lured into his dads car. The dad took him home to Denny's house and Matt was really scared. There was a lot of people searching for him but his sister was working the hardest. Her mom told her to take a break and go to the Mariners game. When she went she found her brother but the dad threatened her with a gun so she had to go with them. After the game Denny takes them to visit his sister. On the boat their Denny is sick of Bonnie so he is trying to push her of the boat but Matt throws a baseball at him and Matt then ran for help. Matt and Bonnie were then home sweet home and Denny was in jail. This book made me realize that to win you can never give up. The reason I thought this was because Bonnie never gave up looking for Matt or getting home safe to their home. This is important to me because it kind of taught me to never give up even if I think its the right choice you always need to try your hardest. This is young adult fiction, and was suggested to me by my son. His review was “the first few pages are slow and boring, but after that you can’t put it down.” It is about the abduction of a child and how people who are don’t want to “get involved” hinder his rescue. Unpredictable story and interesting characters. It is apparently a good choice for younger teens who aren’t 100% into reading, but who enjoy darker themes and a fast-paced story. I'm definitely a little confused as to the audience of this book. Told in a very easy style, it feels like it could have been written for a reader in the 8-10 range, but the content is almost adult in areas - how can we expect a child to understand about the complex feelings of a man who has stolen his child due to severe untreated mental illness? I found this book disturbing, though engaging. I definitely was interested in reading. But Bonnie thinks like an adult, and acts like one, her mother i I'm definitely a little confused as to the audience of this book. Told in a very easy style, it feels like it could have been written for a reader in the 8-10 range, but the content is almost adult in areas - how can we expect a child to understand about the complex feelings of a man who has stolen his child due to severe untreated mental illness? I found this book disturbing, though engaging. I definitely was interested in reading. But Bonnie thinks like an adult, and acts like one, her mother is never even there (very flat and unreal) and we never get to the emotional impact of any of this on anyone. On the other hand, if you used this as a hi-lo book with an adult who's learning to read, or with an older teen perhaps, the subject matter and story will engage, and the pacing of the story and short chapters would make this an ideal book to use in that way. 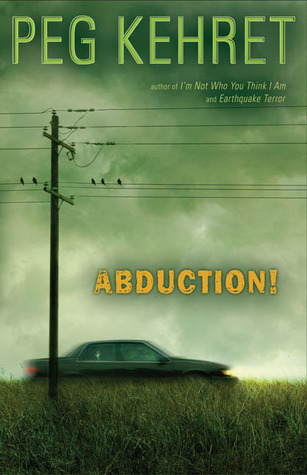 Abduction by Peg Kehret is one of the best books so far, that I've read .Kindergarten student ,Matt, is taking a quick trip to the bathroom, but never returned back. Who grabbed the kindergartener without being noticed and the family dog ,Pookie ? His sister, Bonnie ,try's to find Matt and Pookie, even if she is risking her own life .Will she save them and herself without getting in to trouble ,read this book to find out these questions. i liked this book because i love mysteries and i also love how it it hard to put down the book i got hooked on to this book the first page it is about a boy that goes missing at school and was taken by the mail man and his sister bonnie was so sad because it was her day to watch him i recommend this book to people who like mysteries and things,that make you want to read on. Abduction is a very good book i read it super fast because it was hard to put down. Its about a kid who gets abducted by his dad that he has never met before. The dad stole him and his dog and later found out his sister at the baseball game, and abducted her. They kept giving hints to a lot of different people. This book was very good,but I won't rate it five stars.The plot was interesting,but I just didn't like it that much.The story was about a girl named Bonnie,who's brother was kidnapped.I won't tell anymore spoilers.It was highly suspenseful,but I don't really like bonnie. A good plot, action, believable story, setting, characters, it has it all! Read about the amazing, astounding, hair-raising, action packed, and overall awesome story about Matt and Bonnie as Bonnie solves a mystery of Matt's disappearance to another dreadful moment. kidnapping is not a good choice. Abduction! is a fast-paced story. The writing felt a little bit choppy in the beginning, but gained a proper tone partway through. I was on pins and needles for the last half of the story! Loved this book- great high interest read-aloud. Abduction kept the kids hooked the entire time. Every day on the news, you hear of a child being abducted or an Amber Alert goes off on your phone. Hearing these stories makes you fearful and nervous for the child you don’t know. Now, imagine it was your brother. This was a reality for Bonnie, a 13-year-old girl, whose brother Matt, was kidnapped while at school. She did everything within her ability, even risking her own life, to get him back. Abduction! is a very intriguing and interesting book. Every chapter left you wanting more and aski Every day on the news, you hear of a child being abducted or an Amber Alert goes off on your phone. Hearing these stories makes you fearful and nervous for the child you don’t know. Now, imagine it was your brother. This was a reality for Bonnie, a 13-year-old girl, whose brother Matt, was kidnapped while at school. She did everything within her ability, even risking her own life, to get him back. Abduction! is a very intriguing and interesting book. Every chapter left you wanting more and asking yourself if they would ever get Matt back. First off, Matt was on his way to the bathroom when Denny Thurman, Matt's father that he didn’t know, was dressed up as a UPS driver and used Matt’s dog, Pookie, to lure him into his car. Matt's mother, Anita Sholter, always told him to never go with or talk to strangers, and when he did, he knew it was a big mistake. Once Matt was in the car, he saw that Pookie wasn’t hurt and wondered what the strange man was doing. They had to stop at Marymoor Park for Matt to use the bathroom, since he didn’t at school, and Denny left Pookie there alone, tied to a sign. Each day after school, Matt and Bonnie ride the bus home together every day. Bonnie never saw Matt and instantly went to his classroom to see if he was there. No teacher or student saw Matt after the bell rang, so they called the police. The police did a search and figured out that Matt got into a car outside of the school. Anita, Bonnie, and all of their friends helped look for him, but knew he could be anywhere by now. Meanwhile, Denny threw his costume away at Marymoor Park where he left Pookie. Then he drove Matt to his apartment. Matt thought he would never see his family again. Later on, that day, after they got to Denny’s apartment, Denny told Matt that his sister and mom had died in a car accident. Matt was super depressed but saw that Denny bought him tons of toys and tickets to the Mariners baseball game. The Mariners were Matt's favorite team, and he thought that living with Denny might be okay. After a few days passed, Denny started to gamble again. Denny took back all of the toys that he got Matt because he needed money to pay back his gambling debt, but Matt didn’t mind. He just wanted the Mariners tickets. As the day arrived to go to the baseball game, Denny colored Matt's hair a different color, dressed him weirdly, and made him someone who he wasn’t. Matt wasn’t sure why, but Denny told him he had to dress like that to match the ways his cousins look, who he would meet tomorrow. Matt was thrilled to hear that he had cousins who he could play with and couldn’t wait to meet them. Back at Marymoor Park, Pookie was found by an older couple and they took him home. As they watched the news, they realized Pookie belonged to Matt and took him back to Anita and Bonnie. Once Matt and Denny got to the baseball game, Matt could barely wait and ran inside as fast as he could. Around the middle of the game, Denny left Matt alone in a crowd of thousands of people. Denny had been talking on the phone the entire time at the game. While Matt was bored at the game, Bonnie was mournful over Matt. Her school club was going on a field trip to the Mariners game the same day as Matt. At first, she felt guilty for going, since that was Matt's favorite team. Bonnie decided to go and after they arrived she was having so much fun. She decided to go get a baseball souvenir and saw a boy tugging on his ear, which was what Matt always did. Bonnie decided to get closer to the boy and she realized it was Matt! Denny grabbed Matt's arm and told him they had to leave, although the game wasn't over. Bonnie yelled and ran after Matt, Matt recognized the voice and was so happy to see that Bonnie wasn’t dead. Denny grabbed Bonnie and told her to shut up. Denny threatened that he would kill her if she didn’t be quiet. Later on, Denny took Bonnie and Matt to a restaurant because Matt had to use the bathroom. Bonnie went with him and tried to ask people for help and she even wrote a message with soap on the mirror. Unfortunately, the restaurant was having a murder mystery game day. Matt and Bonnie escaped out of the bathroom window and tried to get away. They stopped a car and asked for help, but the people wouldn’t help them and drove off. Denny then realized they got away and caught them running down the street. He took them to get on the ferry. Denny wanted to try and get away to go see his sister and Matt's cousins before Bonnie could talk to anyone else or speak of what he did. As they got on the ferry, Bonnie gave Matt the baseball she got at the Mariners game. This made Matt a little sad because he thought that might be the last time Bonnie would give him something. After they were on the ferry, Denny wanted to get rid of Bonnie. At first, he told Bonnie to jump off of the ferry so that she would drown. Bonnie thought that she might jump into the water and get help, but the water was freezing and it would do more harm than good. After Bonnie refused, he pulled his gun out from under his shirt, he threatened her and she kept telling him “You’ll never get away with it”, but it seems that he's gotten away with a lot, so she didn’t put it past him. Before he could pull the trigger, Bonnie yelled “ZINGER!”, which was what Bonnie called the hardest pitch Matt could throw. Matt instantly knew what she meant, grabbed the baseball Bonnie have him and threw it right at Denny’s head. He fell face forward, letting Bonnie and Matt run away. The police then captured Denny, took him to jail and told him he would be there for a long time from the money he owes and for all of his crimes. Bonnie and Matt returned home safely and were happy to just be together. “Abduction!” is a very interesting and exciting book. It not only grabs your attention, but it makes you pay attention to situations that happen every day. The details and words used in the story make you never want to stop reading. There were so many cliffhangers that left you wanting more and wanting to know what going to happen next. I rate this book a 5 out of 5 stars and recommend it to anyone who loves exciting, adventurous, mysterious, and a heartwarming book. Do you like thrilling books? IF you can answer yes, then Abduction is the book for you to read. This book starts out from the view point of Denny Thurman. To me he seems like a man who is down on his luck but sees a way he can change that. He is tired of his brother in law, Winston constantly making him feel bad because he doesn't have any kids and rubbing the fact of his two nephews in his face. He finds out where his ex-wife Anita, ex-stepdaughter Bonnie, and son Matt live with their family pe Do you like thrilling books? IF you can answer yes, then Abduction is the book for you to read. This book starts out from the view point of Denny Thurman. To me he seems like a man who is down on his luck but sees a way he can change that. He is tired of his brother in law, Winston constantly making him feel bad because he doesn't have any kids and rubbing the fact of his two nephews in his face. He finds out where his ex-wife Anita, ex-stepdaughter Bonnie, and son Matt live with their family pet, Pookie. He comes up with a plan to steal the family pet to lure his son from school so he could kidnap him and prove to his brother in law he has a son. After he is successful in kidnapping Matt, he gives him a chocolate bar, unknowingly that Matt is allergic to chocolate and he breaks out in hives. They stopped at a park because Pookie threw up in the car after eating chocolate. Denny can't stand dogs so while Matt is in the bathroom, Denny ties Pookie up and leaves him at the park. This makes Matt very sad when he finds out. Meanwhile, Bonnie is very upset and has to call her mom because Matt can't be found and he never is late to get on the bus after he got scolded for doing so once before. An "Amber Alert" was sent out on all TV stations and radios but since no one saw the vehicle Denny was driving, it made looking for Matt and Pookie even harder. Bonnie was doing all she could to help by making and hanging up "Lost" posters for her brother. The police officers and K-9 officers were very nice and extremely helpful. It was very hard on Anita and Bonnie because Anita's first husband, Bonnie's dad, was a firefighter and had died when Bonnie was very little. Bonnie was afraid she had lost her brother too. Denny took Matt to his apartment where Matt begged Denny to call his mom. He was scared because Denny told him that his mom had said he could come live with Denny but Matt knew his mom would never had let him without talking to him about it first. Denny acted like he was talking to someone on the phone but he actually never called anyone. He pretended he was talking to Matt's elderly neighbor, Mrs. Watson, who he said told him that Bonnie and Anita had been killed in an auto accident. Matt was very upset now. So upset that he didn't really hear all that Denny was saying. After that Denny spent a lot of time on the phone and Matt figured out that Denny liked to gamble and taht was how he bought all the nice games and stuff for him. Denny talked to his sister Celia, and made plans to get together with her, Winston and Tim and Thomas the next weekend. He wasnted to show Matt off to them and see if they would give him money to help raise the boy because after all they were rich and they had kids so they knew how costly it is to raise them. Denny got down on his luck again and sold all of the things he had bought for Matt. Matt was kinda sad but not really because Denny never took the time to help him play the games or anything. Denny decided he would take Matt to the Mariner's baseball game. Matt loved baseball so he became really excited again. At the same time, Bonnie was reminded of her trip to the Mariner's game. SHe felt really bad about going but she went anyway because Grandma and Grandpa said she should go have some fun. At the game, she was looking through her binoculars and saw Matt! He looked different because Denny had done something to his hair and was making him wear glasses, but she knew her brother when she saw him! Bonnie told her friend's mom that she saw a friend of her moms and was going to talk to him and went to see if it was really Matt. When she made it around to where they had been seated, they weren't there but she saw them headed towards the parking area. Instead of telling a police officer or somone, Bonnie decided to follow after them. Matt turned around and saw Bonnie and yelled for her. Denny told her he had a gun and she should come with them so no one got hurt and she shouldn't make a scene. Bonnie was afraid of what Denny would do to her and Matt so she followed along. Matt decalred he had to go to the bathroom so Denny finally agreed and they went into a restaurant where a "Mystery Dinner" was going on. Denny finally agreed to let Matt go to the restroom with Bonnie where they tried to alert some ladies that they and been kidnapped but they thought it was part of the plot and that Bonnie was an actress. They finally escaped through the bathroom window and tried to flag down a passing motorist but that didn't work either and Denny ended up catching up with them. This book was wonderful and I would suggest it as a great book to read. Very suspensful! Peg Kehret writes middle grade fiction and nonfiction. She's won dozens of state children's choice awards, where kids vote for their favorite book. When she was twelve, Peg was paralyzed with polio. Most of her protagonists are the age she was then. A volunteer with animal rescue groups, three of Peg's books are co-authored by Pete the Cat."